After announcing his Proclamation of Amnesty and Reconstruction on December 8, 1863, Lincoln paid close attention to two Arkansas groups both aiming for reunion. Here, the president is concerned about potential conflicts with his plan, but in the end, both plans coincided in the key detail of ending slavery. ABRAHAM LINCOLN. Autograph Letter Signed as President, to Frederick Steele. Washington, D.C., January 27, 1864. 1 p., 7¾ x 9¾ in. On Executive Mansion stationery. Little Rock, Arkansas, fell to Union troops led by General Frederick Steele September 10, 1863 and the state’s Confederate government-in-exile moved to the town of Washington, in Hempstead County. A month later, delegates from twenty pro-Union counties met and called a state constitutional convention for January 4, 1864. Throughout the fall of 1863, eventual Union victory became increasingly clear, and on December 8, 1863, Lincoln issued his Proclamation of Amnesty and Reconstruction. This lenient plan that offered citizens of the rebellious states full pardons, voting, and property rights (except possession of slaves), encouraged the states to begin addressing the issue of the freedmen and women without compromising their rights, and, as is relevant here, allowed a former Confederate state to hold elections and form a pro-Union government once 10% of the number of voters in the 1860 election swore loyalty oaths. Commonly called the “Ten Percent Plan,” it reflected both Lincoln’s charitable view of Reconstruction as well as the reality that heavy penalties, denial of voting and property rights to rebels, and impoverishing the South was no way to rebuild a nation after a war fought, at least initially, to preserve the Union. Back, in Arkansas, the pro-Union delegates to the constitutional convention met in Little Rock to write a document that unanimously abolished slavery, maintained much of the state’s old constitution, elected Isaac Murphy as provisional governor, and called for new state elections in March to ratify the new constitution and elect state officers. However, this convention was meeting parallel to Lincoln’s plans. At the time of the convention, Edward W. Gantt, a former Confederate officer who returned to the Union cause after spending time as a prisoner of war in Massachusetts, was leading a different delegation to the White House. 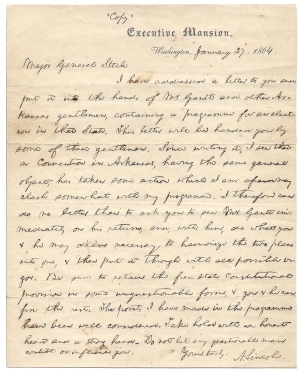 Gantt had been the first Confederate officer to be pardoned by Lincoln on December 11, 1863, and preached “to anyone who would listen that many Arkansans had abandoned the Confederacy and re-embraced the Union.” Gantt’s delegation met with Lincoln to discuss Arkansas’s return to United States, and Lincoln was so impressed he ordered Steele to work with Gantt to ensure the legitimacy of the March election. In a militarily-supervised election, the new Arkansas constitution was adopted on January 19, 1864 and ratified on March 14, although many online sources assert March 4. The Confederate state government-in-exile continued to exist alongside the new constitutional pro-Union state government. Since writing mine of the 27th, seeing still further accounts of the action of the convention in Arkansas, induces me to write you yet again. They seem to be doing so well, that possibly the best you can do would be to help them on their own plan—but of this, you must confer with them, and be the judge. Of all things, avoid if possible, a dividing into cliques among the friends of the common object. Be firm and resolute against such as you can perceive would make confusion and division. The new pro-Union government faced a multitude of problems, some stemming from Gannt’s unpopularity as a perceived turncoat, others from the parallel government-in-exile, and still more from Steele’s ill-conceived military foray (the Red River expedition) to consolidate Union forces in Arkansas and Louisiana. The expedition’s failure brought the state’s Confederate government out of exile and led to new fighting. Moreover, Steele was opposed to emancipation, as well as a Democrat, and pro-Union government supporters thought his sympathetic policies towards Confederates undermined attempts to reestablish a loyal government in Arkansas. These fears were realized when Congress refused to seat the delegation Arkansans sent to Washington in the summer of 1864. Finally, Lincoln’s assassination and the rise of the more punitive Radical Republicans in Congress resulted in the failure of the 1864 state constitution. Arkansas returned to the Union in 1868 under a constitution written under the terms of the Reconstruction Act of 1867, which insisted on the vote for African American males. Randy Finley, “This Dreadful Whirlpool” of Civil War: Edward W. Gantt and the Quest for Distinction,” in Randy Finley and Thomas DeBlack, eds., The Southern Elite and Social Change: Essays in Honor of Willard B. Gatewood, Jr. (Little Rock: U of Arkansas, 2002).